The Institute was founded in Genoa in 1931 by an act of love and solidarity of Senator Gerolamo Gaslini, who wished to honour his daughter, who passed away in her infancy. Gaslini wanted to ensure that children receive only the best possible type of treatment based on the most innovative research. Ever since its founding, Gerolamo Gaslini wanted to host part of the University of Genoa within the walls of the institute, with its own paediatrics chairs in order to ensure the qualified support offered by research and by the training of new generations of paediatricians, nurses and technicians. In 1949 the Founder Gerolamo Gaslini gave up all his possessions in order to merge them into the Gaslini Foundation, which he himself established and chaired. Moreover, Gaslini stated that the resources of his assets were to be unceasingly dedicated to the betterment of the Institutes’s research, treatment and training activities. Since 1988 the Foundation has been chaired by the protempore Archbishop of Genoa. The complex consists of 20 annexes spread over an area of 73,000 m2 (two-thirds of which are green areas) that are well-connected to each other, even on an underground level. 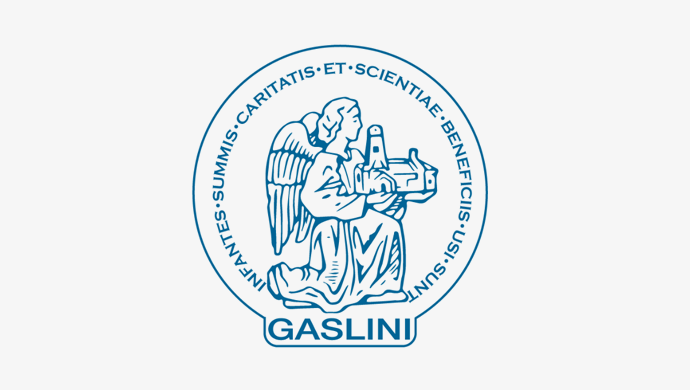 Istituto Gaslini started its activity way back in 1938; seventy-eight years of history, sacrifice and dedication, always at the forefront in the fields of research and treatment, without ever betraying the ideals of the original Founder. Since 1959 the Institute was formally recognised as a Scientific Institute for Research, Hospitalisation and Healthcare. This title has been confirmed time and time again through the years. All paediatric and surgical services are practised at the Institute, which also houses scientific laboratories, as well as affiliated university departments, many of which also have their own related graduate schools and post-graduate specialisation courses. Since its inception, the Institute has continued to grow and change, while always paying due attention to adapt its structures to all changes in the field of medicine, in the healthcare system and in public administration. Almost Eighty -years after its foundation, the Institute is an international reality that is looking forward to its own renovation and expansion, which will allow it to keep up its ability to attract patients from around the world towards highly specialised care, and support more advanced basic and clinical-translational research. In the last decade, the Institute achieved and kept the coveted accreditation for excellence on the basis of the standards of the Joint Commission International, that aims towards the continuous improvement of care supplemented with the utmost levels of safety for patients and staff. The Gaslini Institute has always been a reference point on a national and international level in many disciplines, so much so that it receives thousands of children of ninety nationalities every year, as well as over twenty thousand children from all Italian regions, which constitute around half of all its patients. There are fifteen Centres for Rare Diseases, with the Neuroscience, Neurosurgery, Interventional Cardiology, Cardiac Surgery and Nephrology Centres being the most in demand. The Haematology-Oncology Department is the European Coordination Centre for neuroblastoma, the most common solid tumour in infancy, while the Paediatric Rheumatology centre is the only centre recognised on a European level. Other highly-specialised sectors and national and international points of reference are those for General, neonatal, oncology and orthopaedic surgery, as well as that for Intensive Care. In September 2012, the Institute equipped itself with a new 5-storey annex comprising an area of 6,000 square metres, which is called the “Daytime Hospital” due to its nature of “daytime” healthcare facility. The new annex was specially built and furnished in accordance with the most recent and stringent international quality and safety certifications. It helps provide a single point of reference for external, non-inpatient users, while concentrating nearly almost fully on outpatient activities typical of a day hospital and day surgery unit. In order to help families, patients and users to orient themselves inside the Hospital and make use of services and care, a new multidimensional “Accommodation System” dubbed “CABEF” (Centro Accoglienza Bambino e Famiglia) Child and Family Reception Centre was launched in September 2012. The Centre was designed for different types of users, and avails itself of different profiles, each one entrusted with specific tasks: operators for reception purposes and for providing information, cultural and voluntary mediators for offering support even to foreign patrons; social workers for ensuring that all needs of the family are properly handled, and religious helpers for offering spiritual assistance.